MPC's Metalphoto® Foil Labels are .003” anodized aluminum face stock (.005” optional), with a high-performance permanent pressure-sensitive adhesive. Black or silver images are sealed beneath a sapphire-hard anodic layer for superior resistance against abrasion. Why choose MPC’s Foil Asset Labels? Flexible foil adheres to curved or uneven surfaces. Permanently bonds to high surface energy metals and plastics, and textured and contoured surfaces. Foil will fracture if removed from its mating surface, providing added security. Photosensitive anodized aluminum face stock in .003” (.005” optional). All common symbologies available, including code 3 of 9, I2 of 5, 128, Data matrix and QR codes. Shipped in sequential order, on sheets, in boxes. 100% no missing numbers. 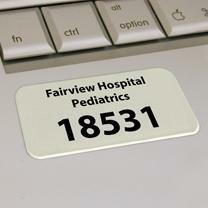 Metal foil labels ship in 10-15 working days from receipt of order and approval of artwork. Expedited shipment of foil labels is available for an additional charge.